TNA General Secretary Mavai Senadhiraja has requested TNA and Opposition Leader R. Sambandan to arrange full armed security to Northern Province Chief Minister C.V. Wigneswaran after discussions with the government. 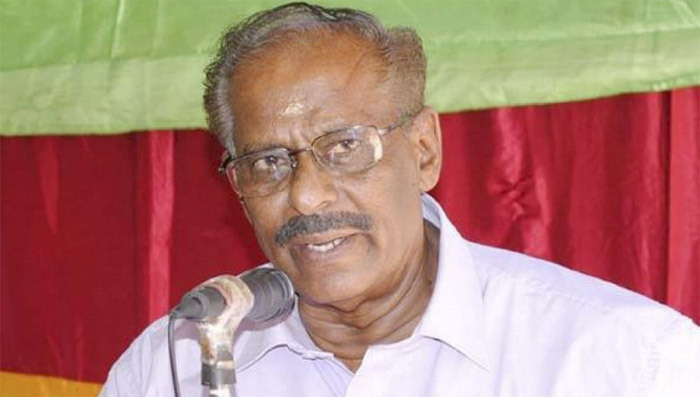 Senadhiraja in a letter addressed to Sambandan has referred to the statement issued by Wigneswaran alleging that there were threats to his life from communalist forces in the South who were trying to harm him and blame it on the LTTE. Senadhiraja has pointed out that it was a serious matter if there were threats to Wigneswaran’s life and as members of the TNA, they should take steps to strenghten the personal security of Wigneswaran after making representations to President Maithripala Sirisena and IGP Pujith Jayasundera. Parties responsible for issuing death threats to Wigneswaran should be arrested after a proper investigation, he said.